It’s all coming back to me now: The feeling I had when first loading Propellerhead's ReBirth RB-338. “It looks like a toy,” I thought on first sight of the dual emulated Roland TB-303 Bass Lines plus TR-808 and TR-909 drum machines. Then I got into it and discovered ReBirth, now reborn as an iPhone/iPod Touch/iPad app, is not only fun to use, it offers much to muzos who like their acid lines squishy and their beats tight and pooky. 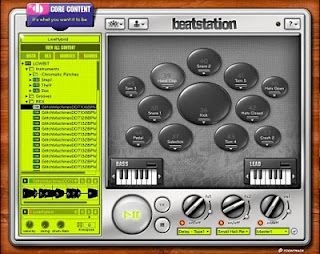 It’s a similar story with Toontrack’s Beatstation, but with added grunge and the facility to use custom sound sources. It does look toy-like - even the skinny (four-page) get-started manual appears graphically designed to appeal to modern yoof - but this sound-mangling suite does have depth. 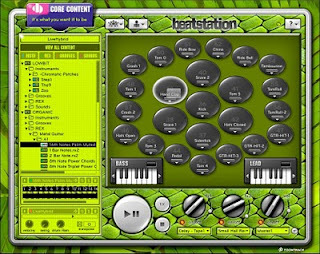 The developer bills Beatstation as a sound-design tool and audio engine. I see it as a hybrid VST, AU and RTAS dual softsynth and REX/WAV/ MP3/MIDI file-player with integrated multi FX, sequencing, sample manipulation... An’ t’ing. Not quite as snappy or high falutin' as Toontrack’s description, but rather more comprehensive. 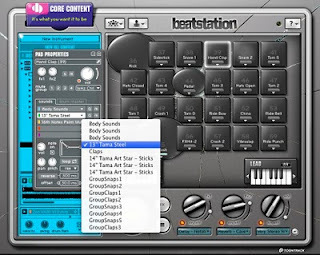 Fuelled by a 1.5Gb core library, Beatstation has VST, AU and RTAS-compatible engines as well as one that chugs away standalone, an implementation offering a sample editor for found-sound fans. The skin-able interface has a performance area featuring blobby-looking trigger pads which can be resized, colour coded and reshaped into squares, shifted around to taste and stacked with up to five audio and/or MDI files apiece. I’m guessing most of us have a wealth of WAVs on our systems. Well they can be loaded, too. Props’ ReCycle REX files are also invited, as are third-party MIDI files and, should you still be stumped, the built-in sample recorder helps out when running the software standalone. 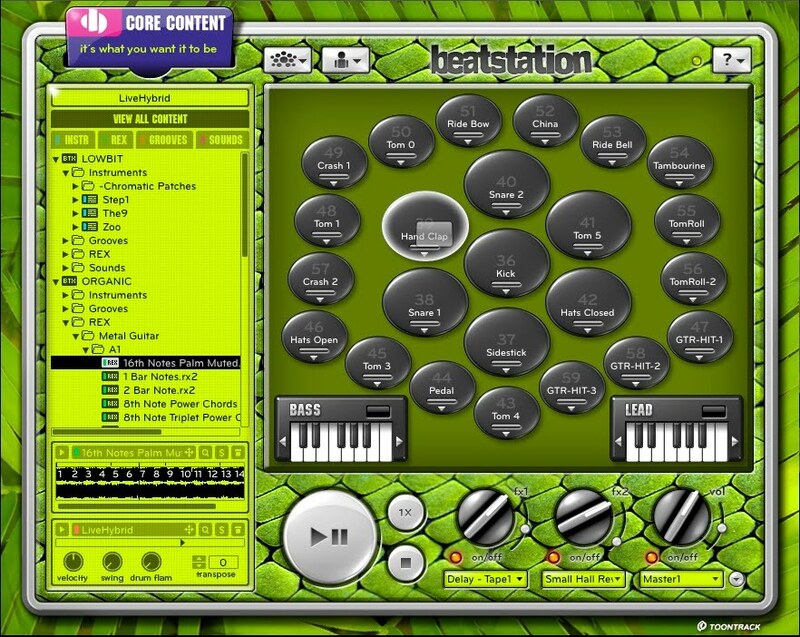 So, unlike a typical ROMpler with a fixed core library, Beatstation is stuffable to the gunnels with sonic goodness. Such sound-shaping essentials as EQ and reverb, routed as inserts or sends are on hand for each stacked sound, for the whole stack and/or globally. We’ve also the means to shift the pan position of each stacked file, apply ADSR envelopes, apply temporal sample offset, pitch shift, define mono/polyphonic playback, apply swing and flam, transpose, reverse, half tempo and double tempo each element and toggle looping on and off. Oh, and and there’s a big play/shut-it button for use when running the software standalone (Beatstation locks to the host sequencer’s transport controls and tempo when used as a plugin). Still, enough with features. Fie on functionality. The big question is ‘what do you reckon it sounds like, Mr Karl?’. Put simply, ‘ouch!’. The default song is slow and super-fat, demonstrating Beatstation’s ability to deliver full-on grunge with aplomb. The default song on loading is a slow, grinding techno riff that certainly acts as a statement of intent from Toontrack and hints that this is a product aimed at muzos who like their club grooves titanic. Knocking up a new groove is a speedy affair, with loops locking seamlessly into project tempo thanks to being REXed. There are numerous gems in the sample library, many of which lurk in the Lowbit section. Consider that developers expend a great deal of effort capturing pristine percussion samples, so what better than to bung in some dirt for contrast? Make big, bouncy, beaty music wherever you go, as rough and ready as you like. 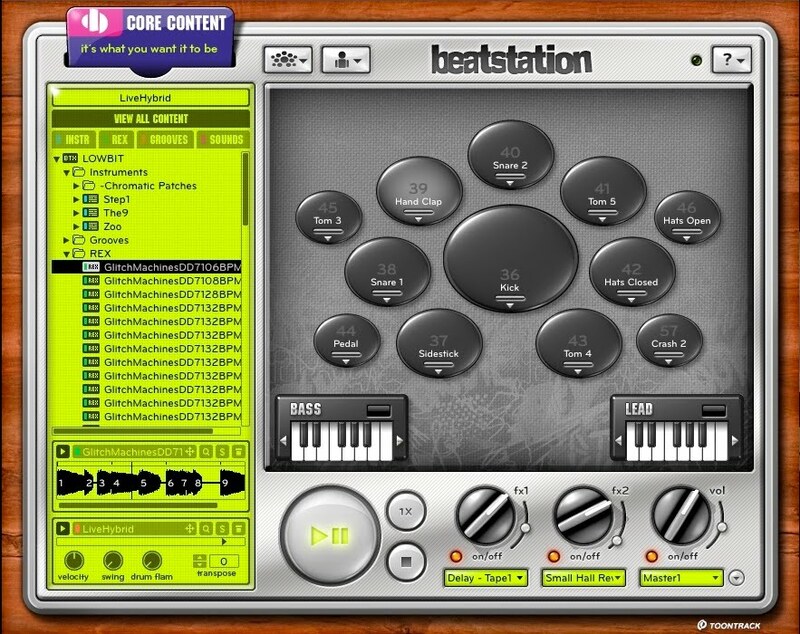 If you tend to sketch out ideas quickly, have a yen for on-the-fly experimentation and need a 1.5Gb boost to your sample library, Beatstation is a no-brainer at £79.99. I doubt it’ll appeal to muzos working in more traditional genres, but those with an outré compositional muse may need tranquilizers to contain their adrenalin.